This production opened on May 4, 2007 and closed on May 13, 2007. 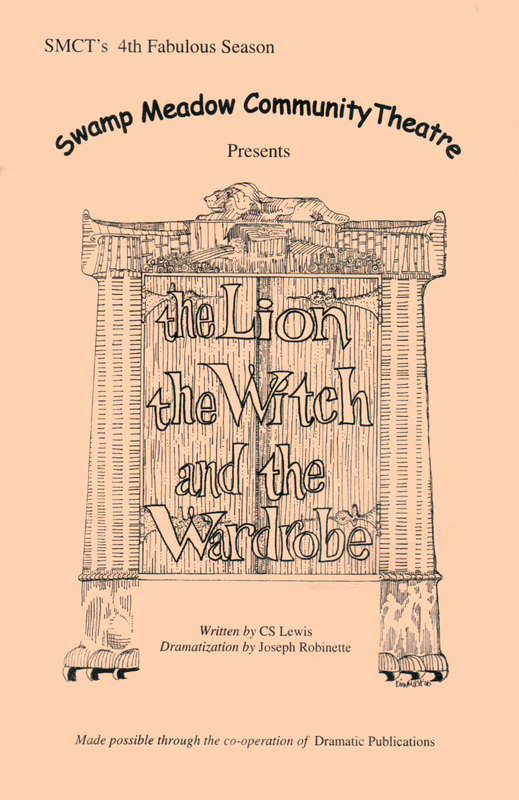 SMCT extends an invitation to mark your calendars for the first two weekends in May to join our cast in Narnia, the setting of Joseph Robinette’s adaptation of C. S. Lewis well-loved fantasy THE LION, THE WITCH AND THE WARDROBE. WANT TO WIN A BACK STAGE PASS? Reserve your tickets at least one week prior to the show online or call 401-397-4740. One winner will be chosen for each performance. Winners will be notified by phone prior to the date of their reservation and will be invited to come 2 hours before the play to meet the cast and crew, observe light and sound checks, watch how make-up and costumes transform the actors and check out the sets. We’re looking forward to sharing our back stage magic with you! The Lion, The Witch and The Wardrobe audition panel worked diligently to cast SMCT’s spring play. 115 actors participated in the audition process. Although this play calls for a cast of 45, the panel decided to extend the cast to 66. Everyone at SMCT wishes to thank all those who attended. A heartfelt thank you goes out to the 49 actors who are equally talented but for whom, unfortunately, there were no more roles available. Our cast list is very impressive and extensive. We have organized them into three groups: the characters from London, Aslan’s followers and The Witch’s army. The four children from London — Lucy, Edmund, Peter and Susan — are played by Dominique DeSimone, Nick Corey, Lucas Henry, and Samantha Pike respectively. Rounding out the London characters are Burr Harrison, Laurie Murphy and Kayli Robinson ( Lucy’s understudy). All those on the side of good are lead by Aslan, played by George Christie. Gary Pickard plays the well loved Tumnus. Bob Hollis and Sherry LaValley will portray the heroes, Mr. and Mrs. Beaver. Other creatures who follow Aslan are: Olivia Harrison, Casey Jo Salzillo, Kayla Gagnon, Haley Talbot, AnaCapri Mauro, Kyle Pickard, Mariah Harrington, Chase Lurgio, Alexander Cerullo, Elizabeth Krug, Liam Dailey, Heather Fernandez, Elizabeth Russo, Julia Davis, Jane Barnes, Sarah Alsfeld, Nathan Miozza, Lily Hemler, Nathaniel R. Parenteau, Sadie Ross, Mallory Cottam, Amanda Betchy, Katie Fantasia, Heron Kennedy, Sierra Kennedy, Cassi Ross, Cara Vieira, Amanda S. Parenteau, Isabella Giorgianni, Aidan Lurgio, Sage Mueller, Chris Brostrup-Jensen, Julia Sepe, John Krug, Krystal La Valley, Alex Fontaine, and John Barnes. The villains are headed by the White Witch, Lona Robillard. The Witch’s cruel dwarf is played by Julia Arnold. Jake Wolf-Jensen portrays the evil wolf, Fenris Ulf. Completing her wicked army are: Bronte Dinges, Kate Krug, Nicholas G. Parenteau, Jillian Cerullo, Wolf Mueller, Nicholas Fernandez, Lauren Capron, Brian Wolf-Jensen, Jacklyn Smith, Meghan Morrissey, Zachary Smith, Jacob Farnum, Abbie Ross, Emily Chretien, Michelle Chretien, and Emma Capron. We will all look for you through the wardrobe door in May. The directing team, Artie Robillard, Sandy Arnold and Heather Christie are pleased with how well rehearsals are going. They are extremely proud of everyone’s efforts and are thrilled to announce that The Lion, The Witch and The Wardrobe will truly captivate audiences. They wish to thank everyone involved in this play, for it’s the efforts of each and every individual sharing his or her talents which enhance the entire production. There are several department heads they would like to acknowledge, for so much of what happens on stage is truly the collective efforts of many. Tammy Casey, our costume director, is once again working her costume magic. Tammy has been an active member of SMCT since joining the crew for The Musical Adventures of Oliver Twist. She has proven to be a very resourceful costume director who adds so much to our productions. Tammy is a great collaborator and is always seeking help in the Costume Dept. If you are interested in helping her create costumes, please contact Tammy at rehearsals, (Tuesday and Thursday evenings at Capt. Isaac Paine School) or through this web site. The sets Marge Lusignan is designing and building are incredible. Marge’s energy and creativity are inspirational. You will marvel at the variety of things she has created for this play, from the 8 ft. tall Wardrobe to the unicorns’ horns. You will be transported to Narnia even before the play begins while at the ticket booth. Ann Valentine, who has been involved in past SMCT productions, is once again sharing her talent with us by composing music for The Lion, The Witch and The Wardrobe that will delight, intrigue, and uplift. Her gift will surely enhance your journey to Narnia. Ray Cooke, local singer, songwriter and guitarist, will be performing during intermission, (or half time, as he calls it). Ray enjoys performing and encourages audiences to sing along with him. It’s certainly a pleasure having him venture through the Wardrobe. Dan and Corey Morrissey, or the Sound Guys, will once again make us all sound great! For this production they will be creating the sounds of war torn London. The Sound Guys have been with SMCT for several years now and it’s always a pleasure working with such professionals. Elise Parmentier, Lighting Director, is another “seasoned professional” who will share her lighting talents to help light the way to Narnia. Elise has been with SMCT for several years and her expertise continues to grow, enhancing every play she’s involved in. Tyler Worcester, Stage Manager has been working backstage for several SMCT productions. He will be keeping the props moving. Producers Lucy Talbot and Mary Jehu do so many different and varied jobs, it’s too extensive to write about. But these two ladies keep the whole show flowing. Without the producers we’d be in big trouble! Also, all the Volunteers who make SMCT productions fabulous.